Note: To celebrate the fiftieth anniversary of the release of 2001: A Space Odyssey, which held its premiere on April 2, 1968, I’ll be spending the week looking at various aspects of what remains the greatest science fiction movie ever made. [The thetans] were brought down, packed up, and put in front of projection machines, which were sound and color pictures. First [it] gave them the implant which you know as “clearing course.” And then a whole track implanted which you know as OT II. After this however, about the remainder of the thirty-six days, which is the bulk of them, is taken up with a 3D super colossal motion picture, which has to do with God, the Devil, space opera, etc. And the uneasiness that Scientologists felt toward 2001 was only an extreme version of the ambivalence of many fans toward a movie that represented the most ambitious incursion that the genre had ever made into the wider culture. Arthur Clarke was working with Stanley Kubrick to put out a motion picture called 2001: A Space Odyssey, and Kubrick, who was investing millions in what might have seemed a very dubious venture…was searching for ways to promote it properly. One way was to get a group of high-prestige individuals to make the movie respectable by having them submit to movie-camera interviews in which they would speak on such subjects as the possibility of extraterrestrial life. I was one of those approached, and I spent hours on May 18, 1966 doing the interview in one of the rooms in the Anatomy Department [at Boston University]…Afterward I heard that Carl Sagan had been approached and had refused to cooperate since no money was involved. It made me uneasily aware that I had given myself away for nothing and had exposed myself as valueless by the only measure Hollywood valued—money. But it was for Arthur Clarke, I told myself, and you can’t let a pal down. Ultimately, the idea of the talking heads was dropped, and none of his footage made it into the finished film. Asimov later wrote approvingly of the movie’s “realistic portrayal of space travel” and called it a “classic,” but although he praised its special effects, he never seems to have said much about its merits as entertainment. We thought that here, perhaps, would be a suitable sequel to the fabulous Destination Moon made twenty years ago…When the final title credits were flashed across the Cinerama screen after the New York premiere, I sat there with the feeling that I’d been had. It’s too bad that the film is billed as science fiction, because it isn’t. It is ninety percent “gee whiz” science gadgetry and ten percent fantasy nonsense…[Audiences] will believe that it is a solid look at the technology of the future. They will instead see a film that is the most cleverly made, subtly done attack on science and technology that has ever been made…It disintegrates into an unexplainable, nonscientific, anti-intellectual psychedelic nightmare. I have long been an exponent of the belief that, should interplanetary visitors actually arrive, no one could possibly convince the public of the fact. These stories wherein the fact is suddenly announced and widespread panic immediately ensues have always seemed to me highly improbable, simply because the average man did not seem ready to visualize and believe such a statement. Undoubtedly, Mr. Orson Welles felt the same way. Campbell, who was just a few years older than Welles, seems to have quickly tired of being asked about The War of the Worlds, which he evidently saw as an encroachment on his turf. 2001 felt much the same to many fans. 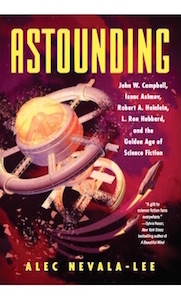 Fifty years later, it’s easier to see it as an indispensable part of the main line of hard science fiction—and perhaps even as its culmination. But it didn’t seem that way at the time.